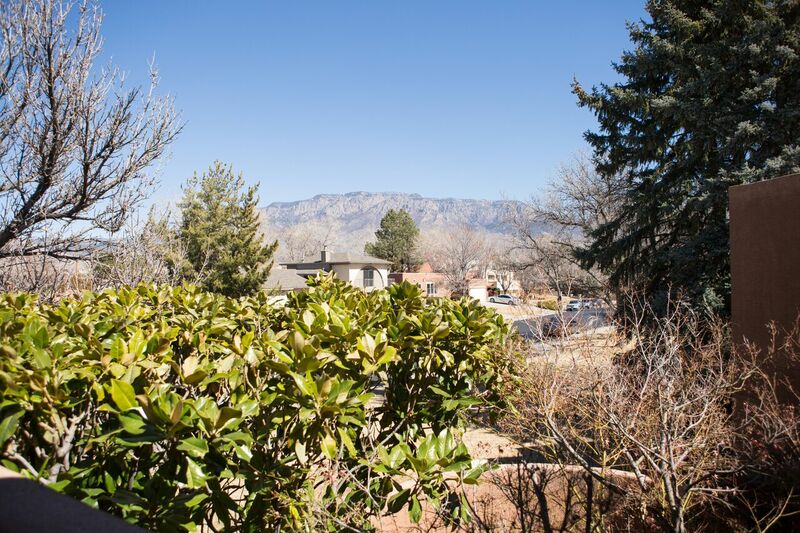 Tanoan is a beautiful gated community nestled against the Sandia Mountains in Albuquerque, New Mexico's east side of town. Tanoan currently has an average of 1500 residents calling this community home, and almost all are homeowners. Tanoan has 2 communities within this estate connected by the lush green golf course and cart paths. Tanoan East consists of the Broodmore, Country Club, Enclave, La Lique, Paganica, Inverness and Highlands subdivisions. Tanoan East is closer to the Sandia Mountains and sits a little higher in elevation from Tanoan West and the Country Club is located in this community. Tanoan West consists of the Cypress Point, Fairway Estates, Fairways North, Kingswood, The Champions, The Masters, Torrey Pines, Village Greens, Village Greens West and Wimbeldon West subdivisions. When you drive into Tanoan the first thing you notice about the community is its great curb appeal with guards at the gate. The grounds are well-manicured, beautiful flowers, mature landscape, nice sidewalks and pathways to take your walk or jog and it is not uncommon to see golf carts driving on by. Stop and listen. Most of the homes enjoy the peace and quiet of the neighborhood so much you can hear the birds chirping. Enjoy the peace and tranquility this community has to offer along with affordable price ranges starting in the mid $200,000’s. There are Townhome/patio homes in the community as well rental homes available. Living in this beautiful Golf Course community, you have a Home Owner Association with covenants and restrictions with mandatory dues starting at $125 per month. This monthly home owner association fee DOES NOT include the Country Club or its amenities. The Country Club and amenities have a separate monthly fee and hinge on what rental package you choose. There are different packages that will accommodate the entire family which include membership to the Golf Course, Tennis courts, swimming pool, amenities to the private club along with rental fees for different items. I am happy to show you property! For your list of current homes on the market for SALE or RENT or for a brochure on the amenities Tanoan has to offer please call or text me directly at 505-803-1872. You may also email me at stephaniewebbrealtor@gmail.com. Appointments are necessary to see houses and many homeowners require a pre qualification or proof of funds. If you need some guidance to start your pre qualification process call me today!